Quintus Labienus was the son of Titus Labienus who served as the principal lieutenant to Julius Caesar during his conquest of Gaul between 58 – 51 BC. Despite this close relationship with Caesar, Titus supported Pompey during the civil war but died at the battle of Munda. Like his father, Quintus joined Brutus and Cassius in their opposition against Julius Caesar. Quintus was an envoy for Brutus to King Ordes II of Parthia. In 42 BC when Brutus was defeated at the Battle of Philippi, Quintus fled to Parthia seeking to join Ordes II. Two years later, Quintus led a Parthian army along with Pocorus, the king’s son. Together they invaded Roman territory advancing into Syria and eventually Palestine. He managed to capture Apamea and much of Syria with the exception of the city of Tyre. He conquered Judaea and installed Antigones on the throne thereby deposing Hyrcanus, thus leaving him a legacy of having a great impact upon Jewish history. Quintus then marched on Cilicia which was his finest achievement. Marc Anthony was slow to respond to Quintus’ invasion. It took nearly one year before Antony sent Publius Ventidius to Asia with several legions. Antony’s legions expelled the Parthians from the region and destroyed Labienus’ forces. When Quintus attempted once again to flee to Parthia, he was captured at Cilicia and finally executed. 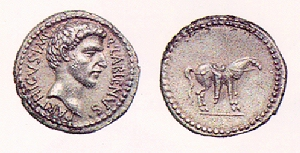 Note: The coinage of Labienus depicts a Parthian horse on the reverse. This eludes to the light cavalry for which Parthia was famous in its day. 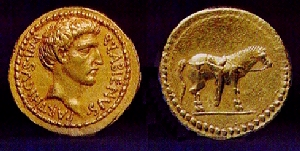 The legend displays a title PARTHICUS suggesting that he was the victorious ally of Parthia.